Dreaming of summer in the depths of a frigid January day has us reflecting on the fun and colorful things of summer 2012. 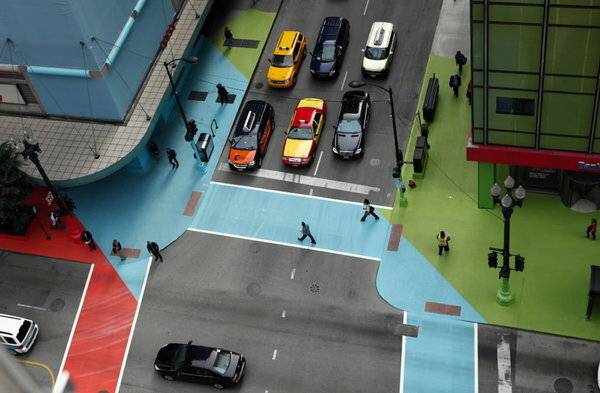 Our neighborhood, in Chicago’s Loop, was bedazzled with surprising displays of playful color. Artist Jessica Stockholder envisioned a “three dimensional painting” spilling out of the windows. We applaud the imagination and gumption it takes to conceive, persuade and execute such a large scale and whimsical installation. Bold color swaths of temporary, foil-backed vinyl covered every possible surface; including heavily trafficked walkways, lamps and store windows. On an otherwise typical gritty urban street corner, broiled in the summer heat, we were treated to these unexpected contrasts and moments of whimsy. We’re looking forward to the interesting sights of next summer. Read more on this story here. Developed in conjunction with Chicago Loop Alliance.